Ryan M: Beginnings have a sense of weight to them. Readers expect that the moment has been chosen with care, to best set up the story that follows. When readers enters the world, they are especially sensitive to the status of the characters. This is the point where a creator can offer a lifeline in the form of a point of view character. Alternatively, we can begin in a state of flux, so that the reader naturally finds the “new normal” along with the plot. Ghostbusters: Answer the Call 1 starts the series with the main characters in a comfortable rhythm with each other and their world. By not challenging their status quo, Kelly Thompson and Corin Howell let the Ghostbusters remain entertaining but not affecting. 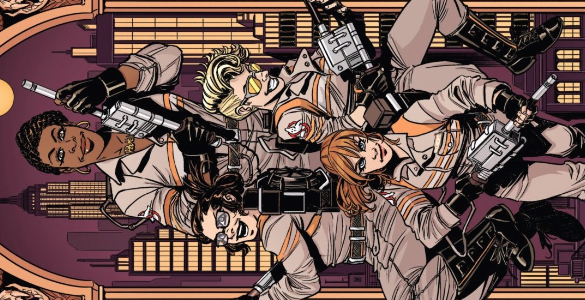 The first issue of this series includes introductions for all four of the Ghostbusters and their pretty-but-dumb assistant Kevin. We meet the crew on a mission and while their messy style belies their relative inexperience, they’ve clearly developed a pattern. The references to previous missions and their defined roles feel more like a barrier to readers than an attempt to bring them in. Even the biggest turn of the issue, Abby’s possession, is treated with an attitude of “oh yeah, we’ve been here before.” The issue ends with a mad scientist ghost trying to attack the Empire State Building, but there’s no sense that this isn’t anything more than a typical Friday night for these women. Thompson spells out each woman’s role explicitly in short introductions that overlay the action. The introductions serve to orient the reader but don’t necessarily add significant context. With Patty, her role as “historian” bears out repeatedly. 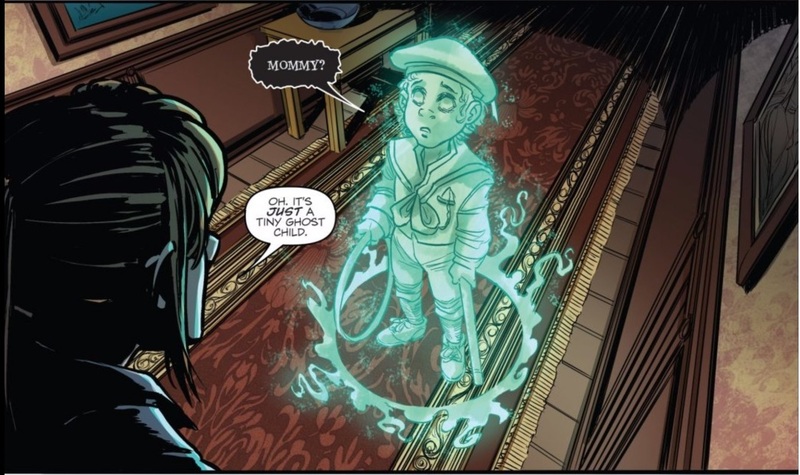 Thompson has Patty explain both the pop-culture relevance of kid ghosts but also do the research on the brownstone. Without Thompson having labeled her that way, it’s likely that the reader still would’ve have been able to glean her role. Erin, on the other hand, is not served by either her introduction or her storyline. She and Abby feel like filler characters. Thompson doesn’t give either of them moments to reveal themselves or their personality. Abby has the excuse of being possessed, but Erin is underserved by the story. The stakes set forth by her intro are that Erin wants mainstream respect. That is never reiterated by the story nor does it inform her behavior. She is a physicist who doesn’t have enough sense not to trust her inept assistant to order lunch? I recognize that this is just a bit, but it’s one of the few things Erin gets to do in the story. Again, I argue that Thompson’s short-changing of Erin is symptomatic of the choice to tell a story with no apparent stakes. The issue is a slice-of-life for these women that requires coming in with a lot of affection for them and their world. That is reasonable given the source material and likely readership. Perhaps the story that Thompson and Howell are telling isn’t supposed to be a traditional arc, maybe it’s the equivalent of a hang out sitcom. You don’t expect every episode of Cheers to explain all the patrons of the bar, you just want to see them bounce off each other and for it all to reset for next week. If we don’t expect an arc or significant change for these characters, it’s easier to sit back and enjoy the Ghost Zamboni. Holtzman is the most dynamic character in the issue and Howell makes her appearance in every panel be just a little odd. Her hair seems to move independently and her physicality is both expressive and surprising. Howell also gives good Ghost. Each of the depictions is able to be appropriately ghoulish while staying in the more cartoonish style of the book. The Tiny Ghost Child in the opening pages with his soulless eyes and short pants makes for an image that is both disturbing and cuddly. Throughout the issue the changing forms of the ghost each have a sense of the menacing. It’s the Ghostbusters’ reactions that deflate the drama. Even after being possessed, Abby is not too put out. Taylor, what did you think of the issue? Does it make you want to see more? How about a Holtz and Patty spin off where they just irritate each other and maybe solve ghost crimes? Taylor: A Holtzman and Patty spinoff would be excellent, since their those two characters are a huge part of what makes the remake of Ghostbusters successful. But if a spinoff were to be made, I would hope that these characters, would be imbued with, well…more character. Indeed, the problem of bland characterization plagues this issue, which is shame given the rich source material it’s drawing from. It might be too harsh to say that this isn’t as successful as the movie, because in many ways comparing a comic and a movie is like comparing apples and oranges. However, Kelly Thompson has been charged with a difficult task in being asked to write this issue. I’ll defend the Ghostbusters remake to the death because, if nothing else, it has an insanely talented cast. Melissa McCarthy delivers on the physical comedy; Kate McKinnon is at her best playing a an oddball caricature of a scientist; Kristen Wigg supplies her usual understated wit; and Leslie Jones is excellent as a foil who reminds everyone that busting ghosts is kind of silly. Thompson is both cursed and blessed with such a strong source material. On the one hand she has a great starting point to jump off from. On the other, that can be hard to live up to. Sadly, the latter seems to be more the case with this issue. 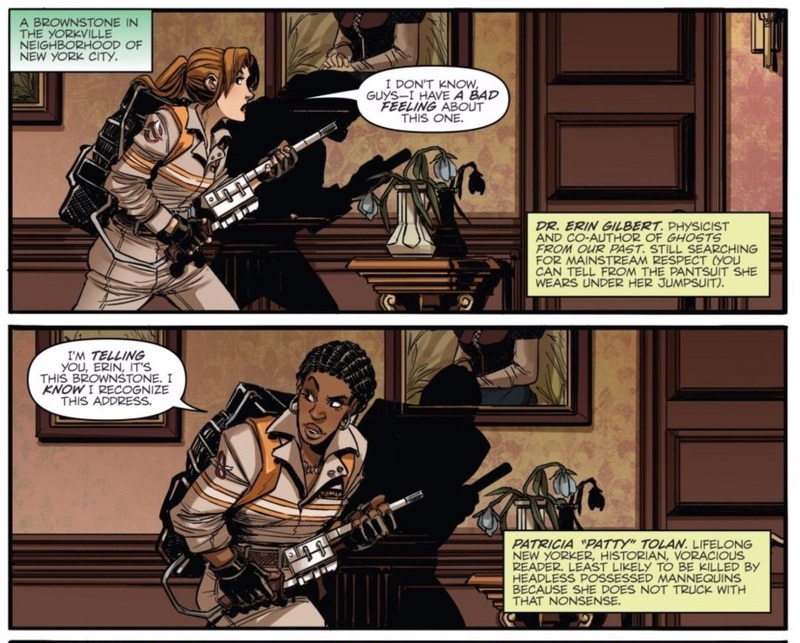 Much of what made the Ghostbusters movie fun was the characters and that’s just not the case in issue. A great example of what I’m talking about can be find in Holtzman’s character. Kate McKinnon knocks it dead in the movie, but the zaniness that make Holtzman so fun to watch in the movie doesn’t translate well to the page. Just look at what happens when the ladies return to their headquarters and Holtzman wants to conduct an experiment. Wanting to stick electrodes onto Patty’s head isn’t exactly the funniest thing. Here, it just seems like Holtsman is being more annoying than anything else, and Patty’s reluctance isn’t so much a manifestation of her character as it’s a natural reaction be being molested by an annoying friend. The things is, had this scene played out on the screen, I could totally see it working. McKinnon is a genius at using inflection in her voice to make a scene and Jones’ deadpan is a perfect yang to that particular yin. It’s just simply that that on screen chemistry isn’t here. It’s hard to say how, or if, that can be pulled off on the page, but this issue would be better if Thompson had found that magic formula. The lack of characterization wouldn’t be so much a sin if the rest of the issue delivered. Instead of doing that, it simply heats up last nights leftovers and expects them to be just as good as when they were fresh. Simply put, I see little reason why Abby needs to be possessed by a ghost, just like in the movie. Thompson puts in a good effort at metahumour by having Abby acknowledge the silliness of her being possessed once again, but it’s just not enough. Ryan, you talked about how beginnings offer artists the chance to establish a new normal or something totally alien, and I only wish that Thompson had had more gumption and really made the Ghostbusters story her own. Since Ghostbusters is a franchise, I get that Thompson might not have all the artistic freedom she wants. That being said, knowing winks to what spawned this comic would be great, whereas retelling story lines from the movie is not. …the problem is that it doesn’t matter how excellent the writing and art is; by using the characters from that universally reviled (especially amongst the comic buying public) crapshow they’ve cut their own feet off at the ankles before they finished trying to stand up. There is no metric by which that movie was a success. Degustibus non disputandem est and all that, you are free to think it’s the best movie ever, bit the plain numbers indicate it was a failure. The movie got mostly positive reviews (Certified Fresh on Rotten Tomatoes), while Kate McKinnon and Chris Hemsworth raked in accolades for their comic performances. Actually watching it in a cinema full of people showed just how much audiences actually liked it – I had a surprisingly laughter filled audience, considering what my country is usually like (and I’m not the only one with that story). And I know for a fact that the characters impacted many of the people who watched, especially McKinnon. And again, Certified Fresh on Rotten Tomatoes. You want to talk about numbers? How about that. If there is any metric most valuable to measure success, shouldn’t it be quality? Considering how often the great movies fail financially and the financial success of movies like Transformers, who cares about money? Especially considering the biggest problem financially was the budget, the fact that it was given a far too high budget for the sort of movie that Ghostbusters was going to be. Just because the execs had the complete wrong idea of what the Ghostbusters IP was valued at doesn’t actually mean much. Yeah, I have a similar story of seeing it opening weekend to a packed house in LA, and we had a good ol’ time. It’s pretty clear from the context of the piece that Taylor is talking about what makes the content of the movie successful – regardless of how well it performed at the box office. Honestly, I’m not sure any modern comedy would translate to comics that well — they pretty much all ride on the personalities of the actors, rather than well-written jokes or meaningful characterization. I initially thought that this movie might be particularly guilty of that — it’s riding on the comedic personae of four of the most well-known comedic actors in the world, after all — but I honestly can’t think of a recent comedy that would make the transition any more gracefully. Maybe Edgar Wright stuff? No offense to the performances that Simon Pegg and Nick Cross deliver, but the writing and directing are obviously what carry those films, and those strike me as the things that might actually translate into comics. Would that Ghostbusters had that caliber of writing and directing. I think you are being very harsh to the performances in Edgar Wright’s movies, especially Simon Pegg’s. He does fantastic comic performances and many jokes rely entirely on him. What frustrates me most about Ghostbusters is how poorly directed the more physical bits are. I can understand leaving space for riffing, but why not rehearse/reshoot physical bits in order to properly frame them? It’s not like the original Ghostbusters was revelatory in terms of direction (though I think the practical effects did force Reitman to be more thoughtful in his shot choices than he normally was), but it was at least competent. I really think the weakness of the 2016 Ghostbusters was Paul Feig. Yeah, Feig is weak with action. A lot of his direction is great at achieving his goals, providing the right situation for talented comedians to improv the scene. Which isn’t interesting, but plays to his strengths as a director. But he is straight up bad at action. Which is an important talent in a movie like this. Which is why the movie is so, so much better when it is just people talking.